NO treatise which deals with symbolism would be complete without a section devoted to the consideration of cryptograms. 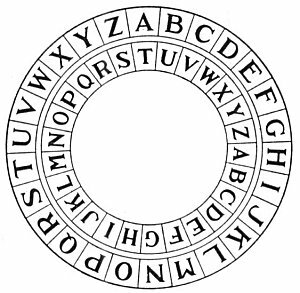 The use of ciphers has long been recognized as indispensable in military and diplomatic circles, but the modern world has overlooked the important rôle played by cryptography in literature and philosophy. If the art of deciphering cryptograms could be made popular, it would result in the discovery of much hitherto unsuspected wisdom possessed by both ancient and mediæval philosophers. It would prove that many apparently verbose and rambling authors were wordy for the sake of concealing words. Ciphers are hidden in the most subtle manner: they may be concealed in the watermark of the paper upon which a book is printed; they may be bound into the covers of ancient books; they may be hidden under imperfect pagination; they may be extracted from the first letters of words or the first words of sentences; they may be artfully concealed in mathematical equations or in apparently unintelligible characters; they may be extracted from the jargon of clowns or revealed by heat as having been written in sympathetic ink; they may be word ciphers, letter ciphers, or apparently ambiguous statements whose meaning could be understood only by repeated careful readings; they may he discovered in the elaborately illuminated initial letters of early books or they may be revealed by a process of counting words or letters. If those interested in Freemasonic research would give serious consideration to this subject, they might find in books and manuscripts of the sixteenth and seventeenth centuries the information necessary to bridge the gap in Masonic history that now exists between the Mysteries of the ancient world and the Craft Masonry of the last three centuries. The arcana of the ancient Mysteries were never revealed to the profane except through the media of symbols. Symbolism fulfilled the dual office of concealing the sacred truths from the uninitiated and revealing them to those qualified to understand the symbols. Forms are the symbols of formless divine principles; symbolism is the language of Nature. With reverence the wise pierce the veil and with clearer vision contemplate the reality; but the ignorant, unable to distinguish between the false and the true, behold a universe of symbols. It may well be said of Nature--the Great Mother--that she is ever tracing strange characters upon the surface of things, but only to her eldest and wisest sons as a reward for their faith and devotion does she reveal the cryptic alphabet which is the key to the import of these tracings. The temples of the ancient Mysteries evolved their own sacred languages, known only to their initiates and never spoken save in the sanctuary. The illumined priests considered it sacrilege to discuss the sacred truths of the higher worlds or the divine verities of eternal Nature in the same tongue as that used by the vulgar for wrangling and dissension. A sacred science must needs be couched in a sacred language. Secret alphabets also were invented, and whenever the secrets of the wise were committed to writing, characters meaningless to the uninformed were employed. Such forms of writing were called sacred or Hermetic alphabets. Some--such as the famous angelic writing--are still retained in the higher degrees of Masonry. Secret alphabets were not entirely satisfactory, however, for although they rendered unintelligible the true nature of the writings, their very presence disclosed the fact of concealed information--which the priests also sought to conceal. Through patience or persecution, the keys to these alphabets were eventually acquired and the contents of the documents revealed to the unworthy. This necessitated employment of more subtle methods for concealing the divine truths. The result was the appearance of cryptic systems of writing designed to conceal the presence of both the message and the cryptogram. Having thus devised a method of transmitting their secrets to posterity, the illuminati encouraged the circulation of certain documents specially prepared through incorporating into them ciphers containing the deepest secrets of mysticism and philosophy. Thus mediæval philosophers disseminated their theories throughout Europe without evoking suspicion, since volumes containing these cryptograms could be subjected to the closest scrutiny without revealing the presence of the hidden message. During the Middle Ages scores of writers--members of secret political or religious organizations--published books containing ciphers. Secret writing became a fad; every European court had its own diplomatic cipher, and the intelligentsia vied with one another in devising curious and complicated cryptograms. The literature of the fifteenth, sixteenth, and seventeenth centuries is permeated with ciphers, few of which have ever been decoded. Many of the magnificent scientific and philosophic intellects of this period dared not publish their findings, because of the religious intolerance of their day. In order to preserve the fruitage of their intellectual labors for mankind, these pioneers of progress concealed their discoveries in ciphers, trusting that future generations, more kindly than their own, would discover and appreciate their learning. A FAMOUS CRYPTIC TITLE PAGE. From Selenus' Cryptomenytices et Cryptographiæ. 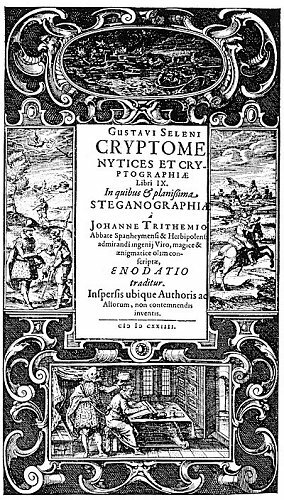 "The Cryptomenysis and Cryptography of Gustavus Selenus in nine books, to which is added a clear explanation of the System of Steganography of John Trithemius, Abbot of Spanheim and Herbipolis, a man of admirable genius. Interspersed with worthy inventions of the Author and others, 1624." The author of this volume was believed to be Augustus, Duke of Brunswick. 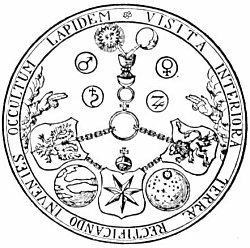 The symbols and emblems ornamenting the title page, however, are conclusive evidence that the fine hand of the Rosicrucians was behind its publication. At the bottom of the picture is a nobleman (Bacon?) placing his hat on another man's head. In the oval at the top of the plate, it is possible that the lights are beacons, or a play upon the name Bacon. In the two side panels are striking and subtle "Shakespearian" allusions. On the left is a nobleman (possibly Bacon) handing a paper to another man of mean appearance who carries in his hand a spear. At the right, the man who previously carried the spear is shown in the costume of an actor, wearing spurs and blowing a horn. The allusion to the actor blowing his horn and the figure carrying the spear suggest much, especially as spear is the last syllable of the name "Shakespeare." who translated the cipher manuscript of the friar, declared: "There are drawings which so accurately portray the actual appearance of certain objects that it is difficult to resist the inference that Bacon had seen them with the microscope. * * * These are spermatozoa, the body cells and the seminiferous tubes, the ova, with their nuclei distinctly indicated. There are nine large drawings, of which one at least bears considerable resemblance to a certain stage of development of a fertilized cell." (See Review of Reviews, July, 1921.) Had Roger Bacon failed to conceal this discovery under a complicated cipher, he would have been persecuted as a heretic and would probably have met the fate of other early liberal thinkers. In spite of the rapid progress made by science in the last two hundred and fifty years, it still remains ignorant concerning many of the original discoveries made by mediæval investigators. The only record of these important findings is that contained in the cryptograms of the volumes which they published. 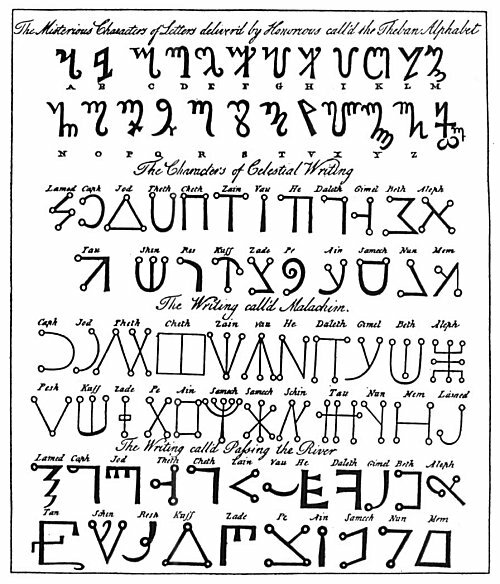 While many authors have written on the subject of cryptography, the books most valuable to students of philosophy and religion are: Polygraphia and Steganographia, by Trithemius, Abbot of Spanheim; Mercury, or The Secret and Swift Messenger, by John Wilkins, Bishop of Chester; dipus Ægyptiacus and other works by Athanasius Kircher, Society of Jesus; and Cryptomenytices et Cryptographiæ, by Gustavus Selenus. 1. The literal cipher. The most famous of all literal cryptograms is the famous biliteral cipher described by Sir Francis Bacon in his De Augmentis Scientiarum. Lord Bacon originated the system while still a young man residing in Paris. The biliteral cipher requires the use of two styles of type, one an ordinary face and the other specially cut. The differences between the two fonts are in many case so minute that it requires a powerful magnifying glass to detect them. Originally, the cipher messages were concealed only in the italicized words, sentences, or paragraphs, because the italic letters, being more ornate than the Roman letters, offered greater opportunity for concealing the slight but necessary variations. Sometimes the letters vary a trifle in size; at other times in thickness or in their ornamental flourishes. Later, Lord Bacon is believed to have had two Roman alphabets specially prepared in which the differences were so trivial that it is almost impossible for experts to distinguish them. A careful inspection of the first four "Shakespeare" folios discloses the use throughout the volumes of several styles of type differing in minute but distinguishable details. It is possible that all the "Shakespeare" folios contain ciphers running through the text. These ciphers may have been added to the original plays, which are much longer in the folios than in the original quartos, full scenes having been added in some instances. The biliteral cipher was not confined to the writings of Bacon and "Shakespeare," however, but appears in many books published during Lord Bacon's lifetime and for nearly a century after his b death. In referring to the biliteral cipher, Lord Bacon terms it omnia per omnia. The cipher may run through an entire book and be placed therein at the time of printing without the knowledge of the original author, for it does not necessitate the changing of either words or punctuation. It is possible that this cipher was inserted for political purposes into many documents and volumes published during the seventeenth century. It is well known that ciphers were used for the same reason as early as the Council of Nicæa. The Baconian biliteral cipher is difficult to use today, owing to the present exact standardization of type and the fact that so few books are now hand set. 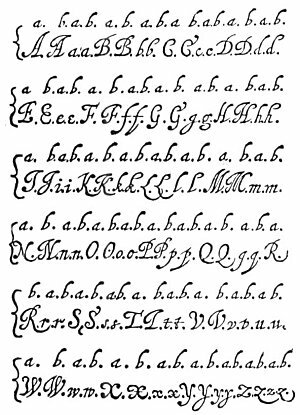 Accompanying this chapter are facsimiles of Lord Bacon's biliteral alphabet as it appeared in the 1640 English translation of De Augmentis Scientiarum. There are four alphabets, two for the capital and two for the small letters. Consider carefully the differences between these four and note that each alphabet has the power of either the letter a or the letter b, and that when reading a word its letters are divisible into one of two groups: those which correspond to the letter a and those which correspond to the letter b. In order to employ the biliteral cipher, a document must contain five times as many letters as there are in the cipher message to be concealed, for it requires five letters to conceal one. The biliteral cipher somewhat resembles a telegraph code in which letters are changed into dots and dashes; according to the biliteral system, however, the dots and dashes are represented respectively by a's and b's. The word biliteral is derived from the fact that all letters of the alphabet may be reduced to either a or b. An example of biliteral writing is shown in one of the accompanying diagrams. In order to demonstrate the working of this cipher, the message concealed within the words "Wisdom and understanding are more to be desired than riches" will now be deciphered. The first step is to discover [he letters of each alphabet and replace them by their equivalent a or b in accordance with the key given by Lord Bacon in his biliteral alphabet (q.v.). In the word wisdom, the W is from the b alphabet; therefore it is replaced by a b. The i is from the a alphabet; therefore an a is put in its place. The s is also from the a alphabet, but the d belongs to the b alphabet. The o and the m both belong to the a alphabet is replaced by a. By this process the word WISDOM become baabaa. Treating the remaining words of the sentence in a similar manner, AND becomes aba; UNDERSTANDING, aaabaaaaaabab; ARE, aba; MORE, abbb; TO, ab; BE, ab; DESIRED, abaabaa; THAN, aaba; RICHES, aaaaaa. The next step is to run all the letters together; thus: baabaaabaaaabaaaaaabababaabbbabababaabaaaabaaaaaaa. All the combinations used in the Baconian biliteral cipher consist of groups containing five letters each. Therefore the solid line of letters must be broken into groups of five in the following manner: baaba aabaa aabaa aaaab ababa abbba babab aabaa aabaa aaaaa. Each of these groups of five letters now represents one letter of the cipher, and the actual letter can now be determined by comparing the groups with the alphabetical table, The Key to the Biliteral Cipher, from De Augmentis Scientiarum (q.v. ): baaba = T, aabaa = E, aabaa = E; aaaab = B; ababa = L; abbba = P; babab = X; aabaa = E, aabaa = E; aaaaa = A; but the last five letters of the word riches being set off by a period from the initial r, the last five a's do not count in the cipher. The letters thus extracted are now brought together in order, resulting in TEEBLPXEE. AN EXAMPLE OF BILITERAL WRITING. In the above sentence note carefully the formation of the letters. 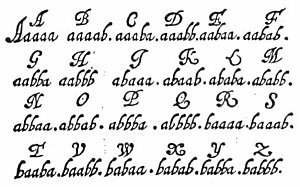 Compare each letter with the two types of letters in the biliteral alphabet table reproduced from Lord Bacon's De Augmentis Scientiarum. A comparison of the "d" in "wisdom" with the "d" in "and" discloses a large loop at the top of the first, while the second shows practically no loop at all. Contrast the "i" in "wisdom" with the "i" in "understanding." In the former, the lines are curved and in the latter angular. A similar analysis of the two "r's" in "desired" reveals obvious differences. 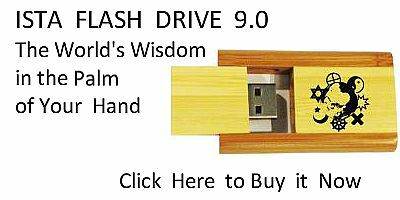 The "o" in "more" differs only from the "o" in "wisdom" in that it a tiny line continues from the top over towards the "r." The "a" in "than" is thinner and more angular than the "a" in "are," while the "r" in "riches" differs from that in "desired" in that the final upright stroke terminates in a ball instead of a sharp point. These minor differences disclose the presence of the two alphabets employed in writing the sentence. THE KEY TO THE BILITERAL CIPHER. From Bacon's De Augmentis Scientiarum. After the document to be deciphered has been reduced to its "a" and "b" equivalents, it is then broken up into five-letter groups and the message read with the aid of the above table. A MODERN WHEEL, OR DISC, CIPHER. The above diagram shows a wheel cipher. The smaller, or inner, alphabet moves around so that any one of its letters may be brought opposite any me of he letters on the larger, or outer, alphabet. In some, cases the inner alphabet is written backwards, but in the present example, both alphabets read the same way. This Plate is reproduced from Bacon's De Augmentis Scientiarum, and shows the two alphabets as designed by him for the purpose of his cipher. Each capital and small letter has two distinct forms which are designated "a" and "b". The biliteral system did not in every instance make use of two alphabets in which the differences were as perceptible as in the example here given, but the two alphabets were always used; sometimes variations are so minute that it requires a powerful magnifying glass to distinguish the difference between the "a" and "b" types of letters. is opposite the H of the outer alphabet, so that for cipher purposes these letters are interchangeable. The F and M, the P, and Y, the W and D, in fact all the letters, may be transposed as shown by the two circles. The nine letters extracted by the biliteral cipher may thus be exchanged for nine others by the wheel cipher. The nine letters are considered as being on the inner circle of the wheel and are exchanged for the nine letters on the outer circle which are opposite the inner letters. By this process the T becomes A; the two E's become two L's; the B becomes I, the L becomes S; the P becomes W; the X becomes E; and the two E's become two L's. The result is ALLISWELL, which, broken up into words, reads: "All is well." Of course, by moving the inner disc of the wheel cipher, many different combinations in addition to the one given above can be made of the letters, but this is the only one which will produce sense, and the cryptogrammatist must keep on experimenting until he discovers a logical and intelligible message. He may then feel reasonably sure that he has deciphered the system. Lord Bacon involved the biliteral cipher in many different ways. There are probably a score of different systems used in the "Shakespeare" folio alone, some so intricate that they may forever baffle all attempts at their decipherment. In those susceptible of solution, sometimes the a's and b's have to be exchanged; at other times the concealed message is written backwards; again only every other letter is counted; and so on. By substituting the letters of the lower alphabet for their equivalents in the upper one, a meaningless conglomeration results, the hidden message being decoded by reversing the process. There is also a form of the literal cipher in which the actual cryptogram is written in the body of the document, but unimportant words are inserted between important ones according to a prearranged order. The literal cipher also includes what are called acrostic signatures--that is, words written down the column by the use of the first letter of each line and also more complicated acrostics in which the important letters are scattered through entire paragraphs or chapters. The two accompanying alchemical cryptograms illustrate another form of the literal cipher involving the first letter of each word. Every cryptogram based upon the arrangement or combination of the letters of the alphabet is called a literal cipher. 2. The pictorial cipher. Any picture or drawing with other than its obvious meaning may be considered a pictorial cryptogram. Instances of pictorial cipher are frequently found in Egyptian symbolism and early religious art. 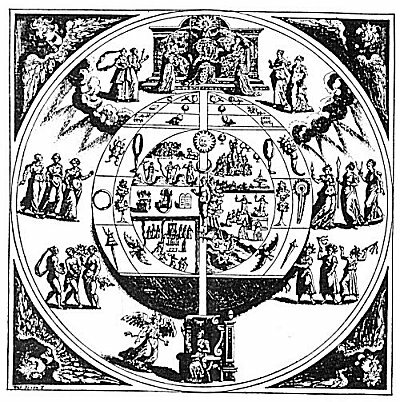 The diagrams of alchemists and Hermetic philosophers are invariably pictorial ciphers. In addition to the simple pictorial cipher, there is a more technical form in which words or letters are concealed by the number of stones in a wall, by the spread of birds' wings in flight, by ripples on the surface of water, or by the length and order of lines used in shading. Such cryptograms are not obvious, and must be decoded with the aid of an arbitrary measuring scale, the length of the lines determining the letter or word concealed. The shape and proportion of a building, the height of a tower, the number of bars in a window, the folds of a man's garments--even the proportions or attitude of the human body--were used to conceal definite figures or characters which could be exchanged for letters or words by a person acquainted with the code. Initial letters of names were secreted in architectural arches and spans. A notable example of this practice is found on the title page of Montaigue's Essays, third edition, where an initial B is formed by two arches and an F by a broken arch. Pictorial cryptograms are sometimes accompanied by the key necessary for their decipherment. A figure may point toward the starting point of the cipher or carry in its hand some implement disclosing the system of measurement used. There are also frequent instances in which the cryptographer purposely distorted or improperly clothed some figure in his drawing by placing the hat on backwards, the sword on the wrong side, or the shield on the wrong arm, or by employing some similar artifice. The much-discussed fifth finger on the Pope's hand in Raphael's Sistine Madonna and the sixth toe on Joseph's foot in the same artist's Marriage of the Virgin are cunningly concealed cryptograms. 3. The acroamatic cipher. The religious and philosophical writings of all nations abound with acroamatic cryptograms, that is, parables and allegories. The acroamatic is unique in that the document containing it may be translated or reprinted without affecting the cryptogram. Parables and allegories have been used since remote antiquity to present moral truths in an attractive and understandable manner. The acroamatic cryptogram is a pictorial cipher drawn in words and its symbolism must be so interpreted. The Old and New Testaments of the Jews, the writings of Plato and Aristotle, Homer's Odyssey and Iliad, Virgil's Æneid, The Metamorphosis of Apuleius, and Æsop's Fables are outstanding examples of acroamatic cryptography in which are concealed the deepest and most sublime truths of ancient mystical philosophy. From Brown's History of Chemistry. James Campbell Brown reprints a curious cipher from Kircher. The capital letters of the seven words in the outer circle read clockwise, form the word SVLPHVR. From the words in the second circle, when read in a similar manner, is derived FIXVM. The capitals of the six words in the inner circle, when properly arranged, also read ESTSOL. The following cipher is thus extracted: "Sulphur Fixum Est Sol," which when translated is: "Fixed sulphur is gold." Beginning with the word VISITA and reading clockwise, the seven initial letters of the seven words inscribed in the outer circle read: VITRIOL. This is a very simple alchemical enigma, but is a reminder that those studying works on Hermeticism, Rosicrucianism, alchemy, and Freemasonry should always be on the lookout for concealed meanings hidden either in Parables and allegories or in cryptic arrangements of numbers, letters, and words. A CRYPTIC DEPICTION OF DIVINE AND NATURAL JUSTICE. The first circle portrays the divine antecedents of justice, the second the universal scope of justice, and the third the results of human application of justice. Hence, the first circle deals with divine principles, the second circle with mundane affairs, and the third circle with man. On the at the top of the picture sits Themis, the presiding spirit of law, and at her feet three other queens--Juno, Minerva, and Venus--their robes ornamented with geometric figures. The axis of law connects the throne, of divine justice above with the throne of human judgment at the bottom of the picture. Upon the latter throne is seated a queen with a scepter in her hand, before whom stands the winged goddess Nemesis--the angel of judgment. The second Circle is divided into three parts by two sets of two horizontal lines. The upper and light section is called the Supreme Region and is the abode of the gods, the good spirits, and the heroes. The lower and dark section is the abode of lust, sin, and ignorance. Between these two extremes is the larger section in which are blended the powers and impulses of both the superior and the inferior regions. In the third or inner circle is man, a tenfold creature, consisting of nine parts--three of spirit, three of intellect, and three of soul--enclosed within one constitution. According to Selenus, man's three spiritual qualities are thought, speech, and action; his three intellectual qualities are memory, intelligence, and will; and his three qualities of soul are understanding, courage, and desire. The third circle is further divided into three parts called ages: the Golden Age of spiritual truth in the upper right section, the Iron Age of spiritual darkness in the lower right section and the Bronze Age--a composite of the two occupying the entire left half of the inner circle and itself divided into three parts. The lowest division of the Bronze Age depicts ignorant man controlled by force, the central the partly awakened man controlled by jurisprudence, and the upper the spiritually illuminated man controlled by love. Both the second and third circles revolve upon the axis of law, but the divine source, of law--Heavenly Justice--is concealed by clouds. All of the symbols and figures ornamenting the plate are devoted to a detailed amplification of the principles here outlined. 4. The numerical cipher. Many cryptograms have been produced in which numbers in various sequences are substituted for letters, words, or even complete thoughts. The reading of numerical ciphers usually depends upon the possession of specially arranged tables of correspondences. The numerical cryptograms of the Old Testament are so complicated that only a few scholars versed in rabbinical lore have ever sought to unravel their mysteries. In his dipus Ægyptiacus, Athanasius Kircher describes several Arabian Qabbalistic theorems, and a great part of the Pythagorean mystery was concealed in a secret method in vogue among Greek mystics of substituting letters for numbers. The most simple numerical cipher is that in which the letters of the alphabet are exchanged for numbers in ordinary sequence. Thus A becomes 1, B 2, C 3, and so on, counting both I and J as 9 and both U and V as 20. The word yes by this system would be written 23-5-18. This cipher can be made more difficult by reversing the alphabet so that Z becomes 1, Y 2, X 3, and so on. By inserting a non-significant, or uncounted, number after each of the significant numbers the cipher is still more effectively concealed, thus: 23-16-5-9-18. The word yes is found by eliminating the second and fourth numbers. By adding 23, 5, and 18 together the sum 46 results. Therefore 46 is the numerical equivalent of the word yes. According to the simple numerical cipher, the sum 138 is equal to the words Note carefully. Therefore in a book using this method, line 138, page 138, or paragraph 138 may contain the concealed message. In addition to this simple numerical cipher there are scores of others so complicated that no one without the key can hope to solve them. There are also numerical ciphers from which the cryptic message may be extracted by counting every tenth word, every twentieth word, or every fiftieth word. In some cases the count is irregular. The first important word may be found by counting 100, the second by counting 90, the third by counting 80, and so on until the count of 10 is reached. The count then returns to 100 and the process is repeated. 5. The musical cipher. John Wilkins, afterwards Bishop of Chester, in 1641 circulated an anonymous essay entitled Mercury, or the Secret and Swift Messenger. In this little volume, which was largely derived from the more voluminous treatises of Trithemius and Selenus, the author sets forth a method whereby musicians can converse with each other by substituting musical notes for the letters of the alphabet. Two persons understanding the code could converse with each other by merely playing certain notes upon a piano or other instrument. Musical cryptograms can be involved to an inconceivable point; by certain systems it is possible to take an already existing musical theme and conceal in it a cryptogram without actually changing the composition in any way. The pennants upon the notes may conceal the cipher, or the actual sounds of the notes may be exchanged for syllables of similar sound. This latter method is effective but its scope is somewhat limited. Several musical compositions by Sir Francis Bacon are still in existence. An examination of them might reveal musical cryptograms, for it is quite certain that Lord Bacon was well acquainted with the manner of their construction. 6. The arbitrary cipher. The system of exchanging letters of the alphabet for hieroglyphic figures is too easily decoded to be popular. Albert: Pike describes an arbitrary cipher based upon the various parts of the Knights Templars' cross, each angle representing a letter. The many curious alphabets that have been devised are rendered worthless, however, by the table of recurrence. According to Edgar Allan Poe, a great cryptogrammatist, the most common letter of the English language is E, the other letters in their order of frequency are as follows: A, O, I, D, H, N, R, S, T, V, Y, C, F, Q L, M, W, B, K, P, Q, X, Z. Other authorities declare the table of frequency to be: E, T, A, O, N, I, R, S, H, D, L, C, W, U, M, F, Y, G, P, B, V, K, X, Q, J, Z. By merely counting the number of times each character appears in the message, the law of recurrence discloses the English letter for which the arbitrary character stands. Further help is also rendered by the fact that if the cryptogram be split up into words there are only three single letters which may form words: A, I, O. Thus any single character set off from the rest of the text must be one of these three letters. For details of this System see The Gold Bug, by Edgar Allan Poe. To render more difficult the decoding of arbitrary ciphers, however, the characters are seldom broken up into words, and, further, the table of recurrence is partly nullified by assigning two or more different characters to each letter, thereby making it impossible to estimate accurately the frequency of recurrence. Therefore, the greater the number of arbitrary characters used to represent any single letter of the alphabet, the more difficult it is to decipher an arbitrary cryptogram. The secret alphabets of the ancients are comparatively easy to decode, the only requisites being a table of frequency, a knowledge of the language in which the cryptogram was originally written, a moderate amount of patience, and a little ingenuity. 7. The code cipher. The most modem form of cryptogram is the code system. Its most familiar form is the Morse code for use in telegraphic and wireless communication. This form of cipher may be complicated somewhat by embodying dots and dashes into a document in which periods and colons are dots, while commas and semicolons are dashes. There are also codes used by the business world which can be solved only by the use of a private code book. Because they furnish an economical and efficient method of transmitting confidential information, the use of such codes is far more prevalent than the average person has any suspicion. In addition to the foregoing classifications there are a number of miscellaneous systems of secret writing, some employing mechanical devices, others colors. A few make use of sundry miscellaneous objects to represent words and even complete thoughts. But as these more elaborate devices were seldom employed by the ancients or by the mediæval philosophers and alchemists, they have no direct bearing upon religion and philosophy. 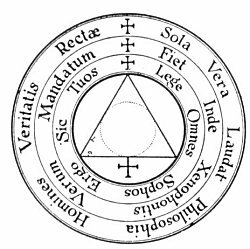 The mystics of the Middle Ages, borrowing the terminology of the various arts and sciences, evolved a system of cryptography which concealed the secrets of the human soul under terms generally applied to chemistry, biology, astronomy, botany, and physiology. Ciphers of this nature can only be decoded by individuals versed in the deep philosophic principles upon which these mediæval mystics based their theories of life. Much information relating to the invisible nature of man is concealed under what seem to be chemical experiments or scientific speculations. Every student of symbolism and philosophy, therefore, should be reasonably well acquainted with the underlying principles of cryptography; in addition to serving him well in his researches, this art furnishes a fascinating method of developing the acuteness of the mental faculties. Discrimination and observation are indispensable to the seeker after knowledge, and no study is equal to cryptography as a means of stimulating these powers. Curious alphabets were invented by the early and mediæval philosophers to conceal their doctrines and tenets from the profane. Some of these alphabets are still used to a limited extent in the higher degrees of Freemasonry. Probably the most famous is the angelic writing, termed in the above plate "The Writing called Malachim." Its figures are supposedly derived from the constellations. Advanced students of occult philosophy will come upon many valuable documents in which these figures are used. Under each letter of the first alphabet above is its equivalent in English. Above each letter of the other three alphabets is its Hebrew letter equivalent.